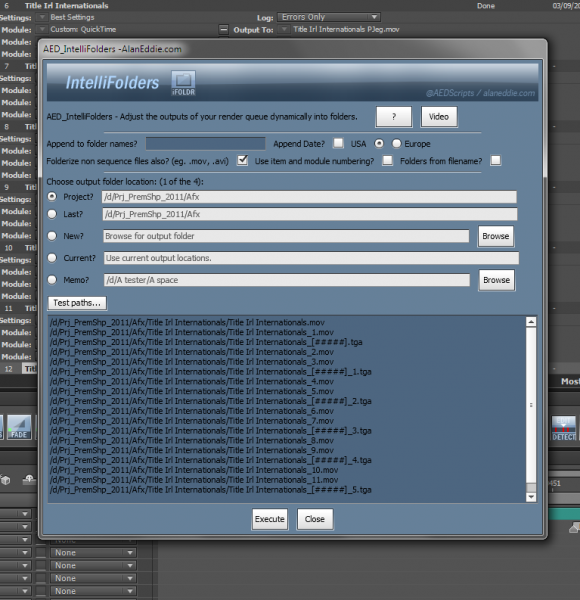 IntelliFolders creates folders based on composition names / filenames. You can automate where your renders are sent using the settings below. 5.Memo location - save a location that you use regularly. -Test your paths before you actually create them. Paths will list without affecting the render Q, when happy just click "Execute"
-Option to append a custom string to the folders (eg. -version2) -Option to create folders just for sequences or all items (.mov, .avi etc.). -Option to make folder from filename rather than comp name. -Option to use item and module numbering. -Script checks for existing folders if you are creating one with the same name, it will skip the module and continue. Keep up to date on alaneddie.com / @AEDScripts & Thanks for buying this tool!